The risk of stroke from atrial fibrillation (AFib) is real, and can quickly change your life. This campaign shares the real stories of people who have experienced and seen first-hand how serious AFib-related strokes can be. They all share the mission of educating patients and their loved ones about stroke risk and prevention, so that they can Celebrate a Year Without a Stroke. A stroke survivor and her husband, an AFib patient and advocate, and a leading cardiologist all share their stories about the importance of stroke prevention with AFib and what Celebrating a Year Without a Stroke means to them. 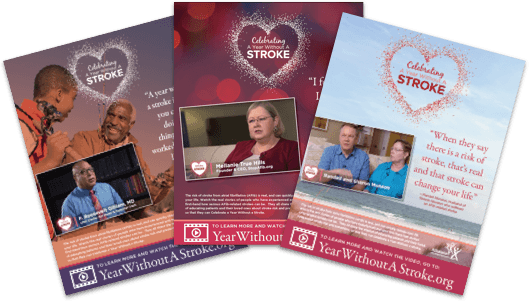 The Year Without a Stroke campaign shares the real stories of people who have experienced and seen first-hand how serious AFib-related strokes can be. The individuals who have shared their stories and all the campaign partners, share the same mission of educating patients and their loved ones about stroke risk and prevention. We hope that you will join this effort to make sure ALL AFib patients celebrate as many years as possible without a stroke. You can use this kit and materials at www.YearWithoutAStroke.org as you plan your outreach, educate your audiences, and encourage others to join this important campaign. Get an overview of the disease in this animated film. Learn more about how AFib causes stroke, and the importance of stroke prevention, in this animated film. La fibrilacion auricular (AFib) afecta la manera sangre flyue a traves del corazon y lo hace vulnerable para la formacion de coagulos, que pueden viajar al cerebro y causar un derrame cerebral en una persona con AFib es 500% mas alto que en alguien sin la enfermedad, el tratemiento para reducir el riesgo de accidente cerebrovascular es esencial. Anticoagulantes, tambien llamados anticoagulantes, pueden ayudar a reducir el riesgo de accidente cerebrovascular. Tiempo hemorragio fatal en un anicoagulante es rara, y para la mayoria de los pacientes AFib, el beneficio de prevenir AFib causado accidentes cerebrovasculares supera el aumento del riesgo de sangrado. This brochure gives an overview of AFib symptoms, diagnosis, treatment, and more. 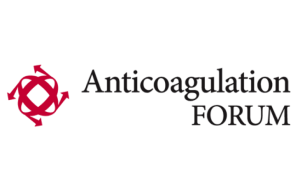 Helping your patients better understand stroke risk and the potential value of anticoagulation. Identifies gaps in current clinical practice, outreach, education, research, and advocacy--identified by leading stakeholders from federal agencies, patient advocacy groups, and more. Shares the leading data on the burden of AFib and the value of innovation. Shares the leading data on the burden of thrombosis, and promising medical innovation. Leading experts in the field make important recommendations on the use of stroke and bleeding risk tools, the decision to anticoagulate, incorporation of patient preferences, and more. A survey of 500+ adults with AFib, age 65+ revealed how they were diagnosed, how they felt about their treatment, and more. Help us spread the word about the importance of stroke prevention! Print out posters for your office, download social media graphics for your outreach, and share the videos via YouTube.